Punta Mita, México, 2016-Dec-15 — /Travel PR News/ — Four Seasons Resort Punta Mita, a five-star luxury resort tucked into the lush landscape of the Riviera Nayarit, debuts a multi-million dollar renovation this winter, providing an elevated oceanfront paradise tailored to modern meeting-goers and groups. The enhancements will bring fresh and innovative spaces to the Resort’s already magical landscape, ideal for beachfront meetings, weddings and private events, along with active experiences for groups including AntiGravity fitness and aerial yoga classes. The fully reimagined Apuane Spa, with treatments and décor inspired by the native Huichol people of the region, and a sophisticated transformation of the adults-only Tamai Pool, will offer beautiful venues for activities outside of the boardroom, including team relaxation and al-fresco cocktail hours. The redesign of two of the Resort’s signature luxury suites, Sol and Luna, will create expansive four and five-bedroom accommodations for executives, groups and families seeking the height of luxury and shared experiences. For active professionals and travellers, the Resort will debut new AntiGravity fitness and aerial yoga classes. Created by fitness expert and founder of AntiGravity Christopher Harrison, the new classes will offer a unique way to open up space in the body and mind. 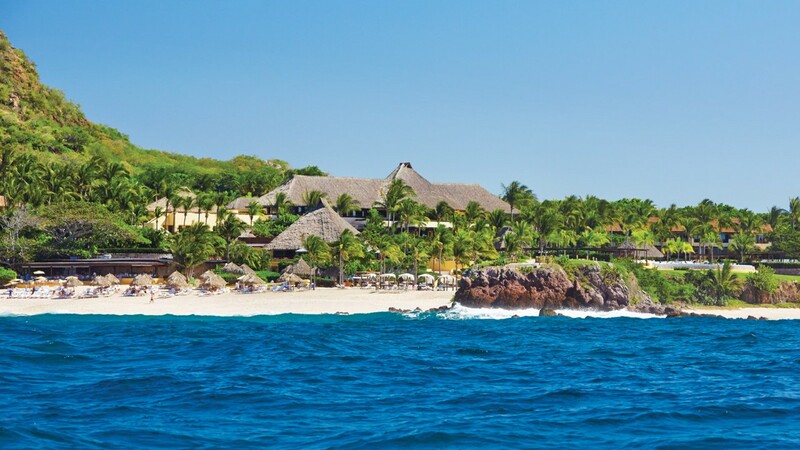 Four Seasons Resort Punta Mita offers ocean adventures in Banderas Bay, including snorkeling, scuba diving, kayaking and paddle boarding and surfing excursions by boat to find the perfect wave. Golf enthusiasts can take part in private clinics with storied golfers such as Lorena Ochoa, Johnny Miller, Craig Stadler and other notable PGA pros. Clinics can be arranged for groups of all sizes and are offered across two world-class Jack Nicklaus golf courses. Destination-inspired culinary experiences at the Resort include historically inspired cooking classes and a new tequila blending and tasting experience with the Resort’s Cultural Concierge. Additional leisure experiences at the Resort include basketball, volleyball, salsa dancing or cruising aboard the Resort’s private yacht. Onsite activities for groups also include ways to give back to the destination with the sea turtle release program that benefits RED Tortuguera, a local sea turtle conservation organisation. The Resort also provides easy access to offsite group adventures where guests can connect with the breathtaking natural setting that surrounds them including zip lining, horseback riding, ATV adventures, sailing, island-hopping, dolphin adventures, and whale watching. Guests can test their survival skills during team-building excursions held on secluded nearby beaches, or slip away to relax at the exclusive hidden beach on Las Marietas Island, only a quick 15-minute boat ride from the Resort. The nearby Plaza La Cruz immerses guests in a real town plaza with artisans and mariachis, available as a unique venue for groups and private events. Encompassing 14,000 square feet (1,300 square metres) of outdoor space and 8,000 square feet (740 square metres) of indoor space, venue options at the Resort can be tailored to intimate and large sized groups, with key function spaces including the beach-facing Takua Event Palapa, the magnificent Toki Ballroom, the naturally beautiful Las Manzanillas Beach and two famed Jack Nicklaus signature golf courses. The Resort’s innovative food and beverage program offers customised menus created to reflect each group’s tastes, authentic dishes that celebrate the destination, and three world-class restaurants: Aramara, Ketsi Restaurant and Bar, and Bahia by Richard Sandoval. For reservations, contact your travel advisor, call the Resort +52 (329) 291-6000 or book online. This entry was posted in Beach Holidays, Hospitality, Hotels, Resorts, Travel, Travel Management, Travel Services, Travelers and tagged aerial yoga classes, AntiGravity fitness, Apuane Spa, beachfront meetings, Four Seasons Resort Punta Mita, John O’Sullivan. Bookmark the permalink.